Despite their popularity, sharks are a group of fish that we know remarkably little about. While we do know that they are highly vulnerable to overfishing and climate change, basic information on movements, population structure, behavior, and life-history are unknown for many vulnerable or exploited species of sharks, skates, and rays. Our research on sharks, skates, and rays—known as elasmobranchs—focuses on delivering scientific data that can be used to improve the management and conservation of threatened or data-poor species. We study everything from basic species life history to behavior to broad-scale movements. In addition to research on the animals themselves, we also focus on how sharks interact with fisheries. Our scientists evaluate the effects of various types of fishing gears and fishing practices on sharks and explore methods to either avoid catching sharks or minimize the amount of stress and injury inflicted during capture and release. To do this we can collect blood samples to measure various indicators of stress or even tag the animals to see if they survive release. For short-term studies of fine-scale behavior or survivorship we often use acceleration data loggers, the same technology found in smartphones and Fitbits™, to measure every tailbeat and change in depth and body posture of the shark for days at a time. For longer-term studies of movements and residency we often use acoustic or satellite telemetry to track the animals for months or years at a time. Did you know that scientists at the Anderson Cabot Center for Ocean Life have tagged more than 40 species of sharks, skates, and rays? This research is vital to filling in the blanks about these important, but often mysterious species. Experience the cutting-edge research done by Anderson Cabot Center scientists first-hand by visiting the Science of Sharks exhibit at the New England Aquarium! Anderson Cabot Center scientist prepares to fit a blacktip shark with an ADL. The goal of this study is to develop new data-logger tag/float package technology that will allow us to collect up to a week of fine-scale acceleration data from highly migratory animals, as well as a smaller package that can be applied to sport fish species. This will provide definitive information on animal mortality and/or recovery, while also ensuring that tag packages are found and recovered so they can be reused multiple times. Reusing tags allows us to obtain higher sample sizes than past studies, and improves our ability to draw significant correlations between blood stress parameters and animal outcomes. This is critical as we begin to target species of concern that are thought to be highly vulnerable to capture stress. 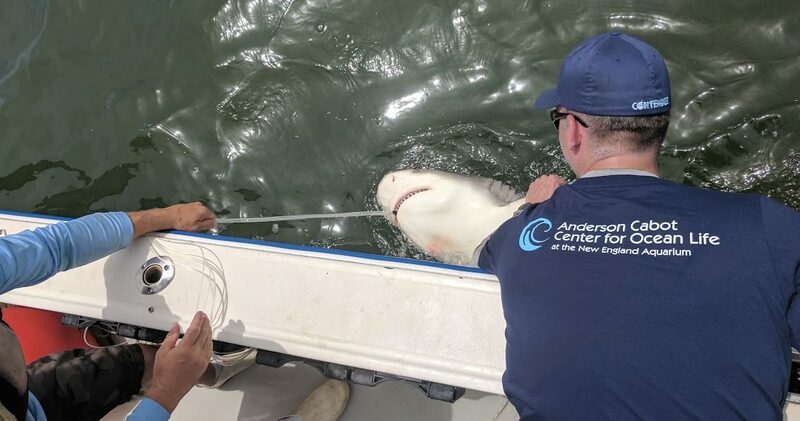 This is a continuation and expansion of a NOAA-funded project that is proving highly successful and efficient in documenting the post-release mortality and behavior of large coastal sharks caught in the Florida commercial shark fishery. The study integrates conventional and novel techniques that are revolutionizing the study of post-release mortality in coastal species in order to quantify the post-release behavior and recovery of dusky sharks (Carcharhinus obscurus), Great hammerhead sharks (Sphyrna mokarran) and scalloped hammerhead sharks (S. lewini) in the Florida shark commercial longline fishery. Shark mating behavior is rarely seen and nearly impossible to study directly. Most of what we know about mating behavior in sharks comes from rare, chance encounters by divers, or from a long-term study on a single population of nurse sharks in the Florida Keys. This project uses high-resolution accelerometer tags to reveal the mating behavior of sharks using the same technology found in smartphones and Fitbits™. The goal is to use these devices to answer questions about where and when different species of sharks mate. How does mating behavior compare between species? What is the difference in mating frequency and energy expenditure between males and females and what can this tell us about how these species are likely to respond to population pressure or loss of critical mating habitat. Shark movement patterns and habitat use dictate species population structure and greatly influence the extent to which they are impacted by anthropogenic stressors, such as habitat degradation or fishing pressure. Monitoring shark movements also provides key information on the location of ecologically important areas (such as feeding or nursery grounds) and insight into the influence of changing environmental conditions on shark distribution. Working with collaborators at the Massachusetts Shark Research Program, the University of Massachusetts Dartmouth, and the National Marine Fisheries Service Apex Predator Program, we use acoustic and satellite telemetry to characterize short- and long-term shark movements and habitat use along the U.S. east coast. Data generated by our research are used to identify essential fish habitat and define population/stock structure for imperiled and commercial and recreationally important species. Current projects focus on juvenile sand tiger and common thresher sharks. This study aims to assess the effects of climate change induced warming ocean temperatures on shark reproduction. We are rearing different shark species in various temperatures predicted over the next century and measuring changes in growth, development, and physiological performance to understand how elevated temperatures impact reproductive output and physiological performance. This will aid in predicting shifts in distribution and population size that will impact ecosystem dynamics–crucial information needed for ecological risk assessment and policy. The thorny skate (Amblyraja radiata) population in the Gulf of Maine is currently at historic lows despite a possession ban on the species since 2003. At present, it is not known if the continued decline is due to ongoing incidental fishing mortality, environmental factors that are affecting the population through reduced productivity and/or distribution shifts, or a combination of these factors. To answer these questions, we are working with local commercial fishermen and using pop-up satellite archival tags to 1) evaluate thorny skate movement patterns and population structure in the Gulf of Maine, and 2) estimate the discard mortality rate of thorny skates that are caught as bycatch in the northeast commercial trawl fishery. Data collected by these studies will be instrumental in the establishment of appropriate thorny skate stock boundaries in the region, and provide direct insight into the factors that may be inhibiting stock recovery. We also hope to provide clear recommendations on best-practice fishing and handling methods for reducing post-release mortality in trawl-caught thorny skates. Visit the Marine Conservation Action Fund (MCAF) page to see how the Anderson Cabot Center supports the shark, ray, and skate research of conservation leaders in developing countries.